We've had so much fun with our Teddy Bear Olympics, from discovering different countries to exploring a variety of sports & even creating our own, this theme has offered so many opportunities for play, discovery & learning. 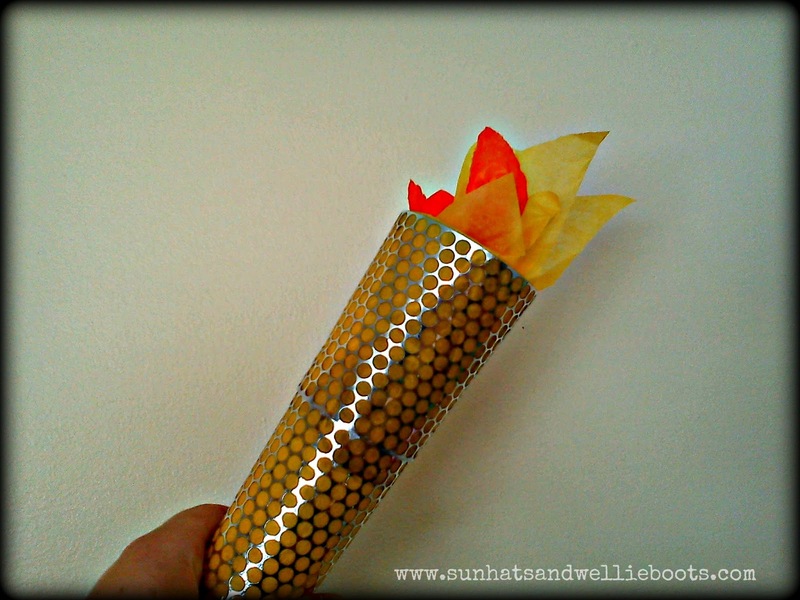 Our Teddy Bear Olympics wouldn't be complete though without an Olympic torch, so today we're sharing how we created two versions, one to play & parade with, & the other to decorate a wall or window. Our first Olympic torch is ideal for smaller hands to hold, & is sturdy enough to withstand the odd knock or two! 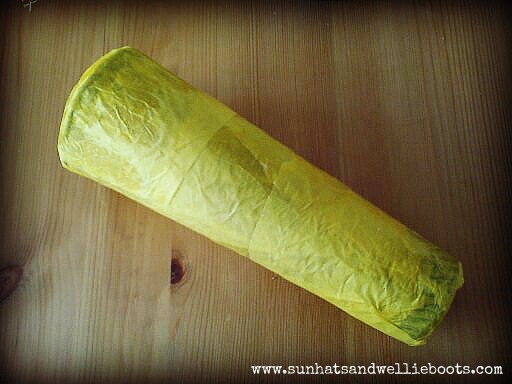 We started by covering the cone with glue & covering in strips of yellow tissue paper. We used the punchinealla to represent the perforated circles on this year's Olympic torch, & attached it to our cone with another layer of glue, securing the ends with tape. 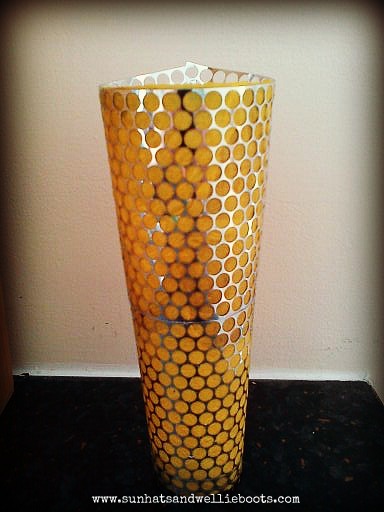 There are 8,000 circles on this year's torch which not only act as air vents, but also represent the 8,000 torchbearers who will carry the flame around the UK before it reaches London for the Opening Ceremony on 27th July. 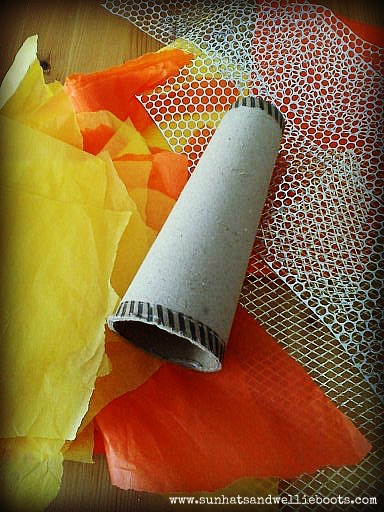 To make the flame we simply pushed a few strips of tissue paper into the end of the cone. 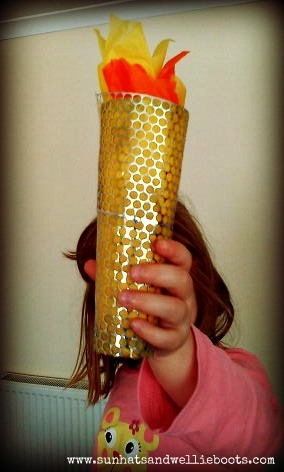 And here's our Olympic Torch ready to be paraded around the garden & beyond!! 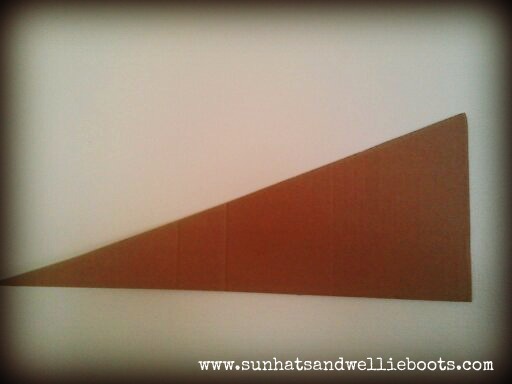 Our second torch was super simple to put together & looks great on any wall. 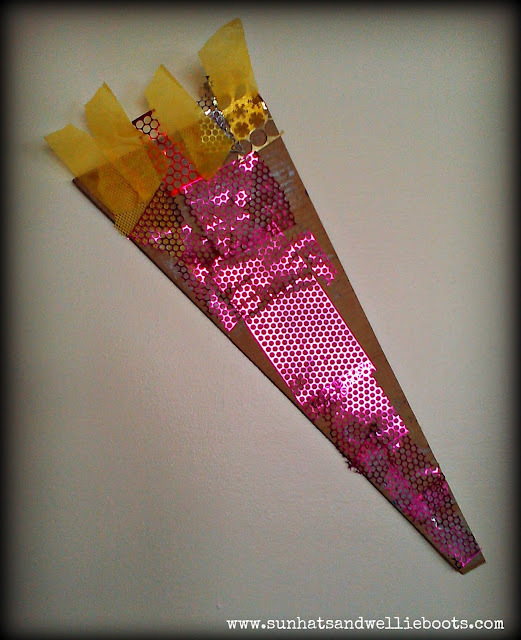 We cut a triangular length of card from a cardboard box, which Minnie decorated with punchinella & tissue paper. It was only later I realised the significance of the three sided card. Did you know the Olympic Games promotes three values; Respect, Excellence & Friendship? Such great values to share with children. Or how about using the three sides of the triangle to represent the Olympic moto "Faster, Higher, Stronger". 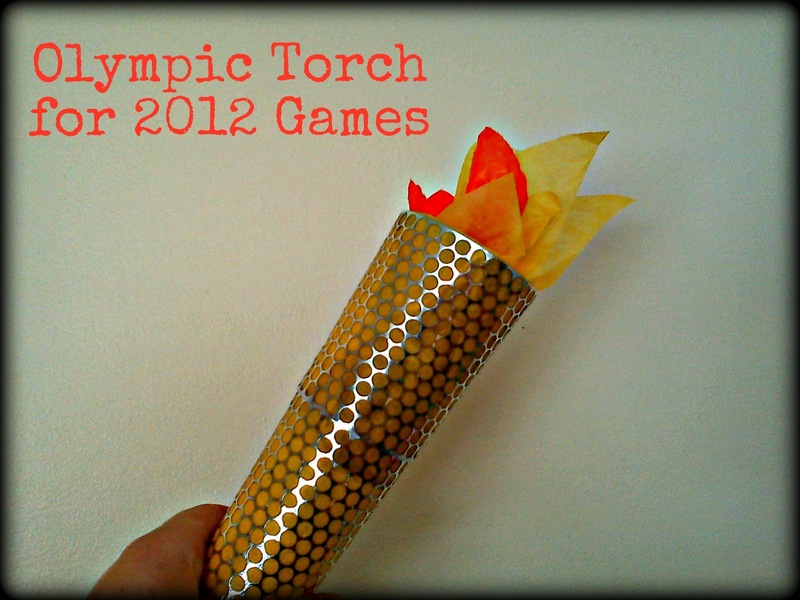 With our torches completed it was time to make our medals. 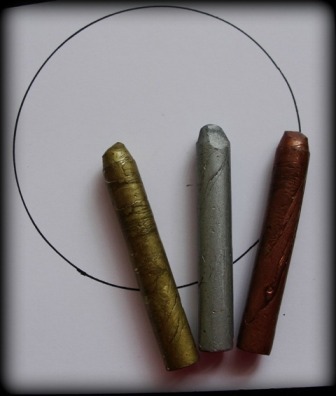 We drew around a cup to create our circles, then Minnie coloured each one in, cut them out & added a hole (with the hole punch) before threading the wool through. On the back of each medal I added 1st, 2nd, or 3rd to help Minnie understand what the gold, silver & bronze medals represented. 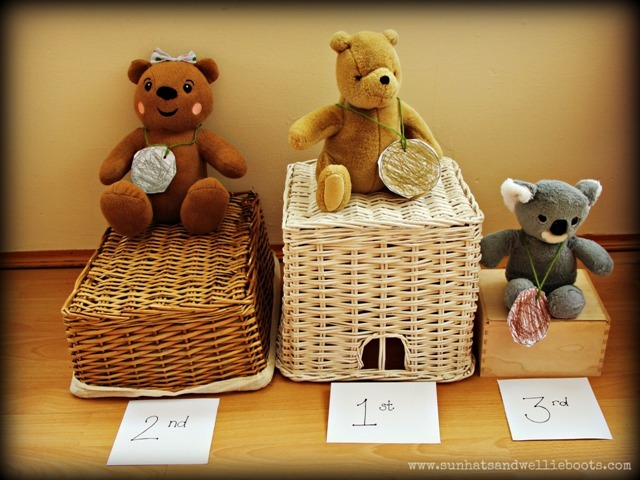 We made a set of winners podiums using upturned baskets & a box (each descending in height) & added small cards by each with 1st, 2nd & 3rd to help her match the medals. 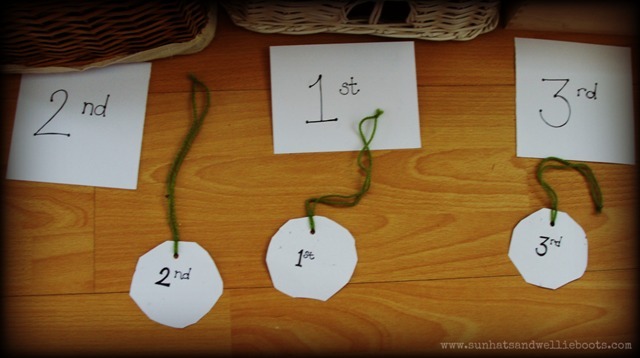 Great for exploring numbers, sequencing, size, & colours. And here the winners are looking resplendent with their medals! These have been used again & again, & the medals are currently hanging by Minnie's bed! The torch has been paraded around the house & garden & we've been asked to stand & cheer as she races past with it. I'm sure come the 27th of this month they'll be paraded even more! 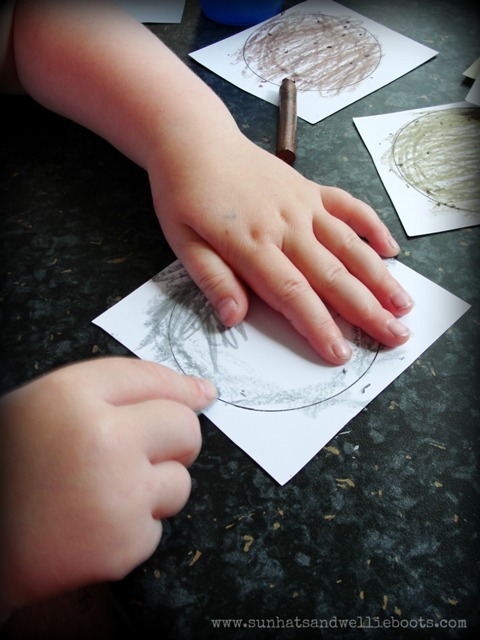 So much physical & creative play from some paper & card - just wonderful!